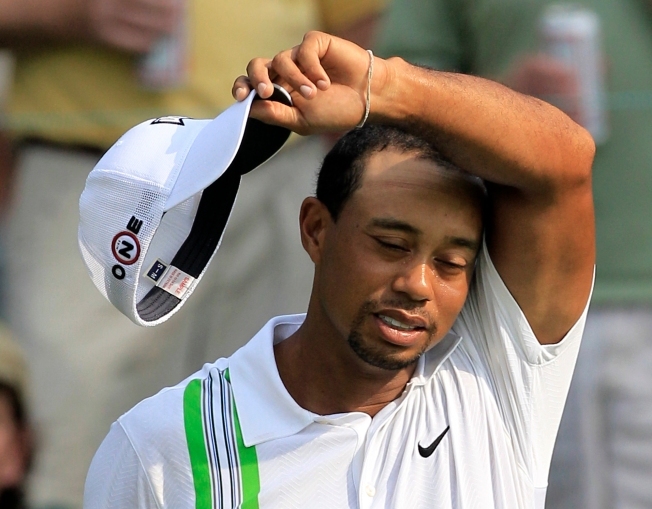 Tiger Woods wipes away sweat from his forehead on the 17th green during the first round of the Bridgestone Invitational golf tournament at Firestone Country Club, Thursday, Aug. 5, 2010, in Akron, Ohio. Woods finished at four-over par after round one. Not even one of his favorite golf courses is much use to Tiger Woods these days. Facing the two easiest holes to start his round, he hit tee shots into the trees and made bogeys. On the course where he has won seven times in his last nine appearances, he posted a 4-over 74 for his highest score ever at Firestone. That put him 10 shots behind Bubba Watson, the largest first-round deficit Woods has faced since he returned at the Masters. And it didn't get any better when he finished Thursday in the Bridgestone Invitational. As he took the 100-yard walk to the scoring trailer, one spectator called out to Woods, "You're washed up, Tiger. Give it up." Woods, sporting a goatee but rarely a smile, offered no excuses. "Only thing I did good today is I kept my patience out there," he said. It was another example of Woods at war with his game, even on golf courses where he once won with alarming regularity. He collapsed early in the final round at Pebble Beach, where he had won the U.S. Open by 15 shots the last time it was there. He was never a factor at St. Andrews, where he had won the British Open twice by a combined 13 shots. His dominance is even more defined at Firestone, where he had never shot worse than 72, where he had never finished worse than fifth. Instead, the day belonged to a guy who had never been here. Watson made his debut at Firestone by running off four straight birdies on the back nine and making a long putt on the final hole for a 6-under 64 and a two-shot lead over a group that included Masters champion Phil Mickelson and U.S. Open champion Graeme McDowell. "I was impressed about Tiger Woods having seven wins here," Watson said about seeing the South Course for the first time earlier in the week. "But with Tiger's wedge game, and his putter is phenomenal, I can see where he could win." That was hard to imagine on a muggy, breezy afternoon in northern Ohio. "Just because I like the golf course doesn't mean I'm going to play well on it," Woods said, who hit only five fairways and took 32 putts. "You still have to execute, and I didn't do that. I did not execute the shots that I wanted to execute, didn't shape the ball the way I wanted to shape it, and certainly did not putt well." Two drives into the trees. Two shots to get out of a bunker. Putts that really didn't scare the hole. When he rolled in an 8-foot birdie putt on the 17th hole, he turned in two directions and bowed to the gallery. The course wasn't much of a problem for so many others. McDowell finished with four straight birdies for a 66. Mickelson was trying to keep his momentum with a par toward the end of his round when he hit a flop shot that dropped in for birdie on the sixth, and then he added two birdies on his last three holes for a 66. Adam Scott, who played bogey-free, and Kenny Perry also were at 66. The group at 67 included Jeff Overton, who finished second last week at the Greenbrier when Stuart Appleby closed with a 59. Twenty-five players from the 81-man field broke par. Watson is playing only his second World Golf Championship, having qualified in June by winning the Travelers Championship for his first PGA Tour victory. He sobbed on the 18th green that day in paying tribute to his father, who is battling throat cancer, and Watson is coming off a two-week vacation that included time at his lake house with his family. "It's tough to make shots around this golf course," Watson said. "I knew it was going to be tough, but today, I just putted really well, hit good iron shots and made it look a little bit easy. But we're not done yet." It's an impressive cast right behind him. Mickelson, long fascinated by distance, decided at the urging of swing coach Butch Harmon to shorten the shaft in his driver to 44 inches. Whether he lost distance was of little importance, for Lefty was thrilled to see the ball go straighter. This is his sixth tournament with a chance to go to No. 1 in the world. Mickelson could replace Woods at No. 1 by finishing as low as fourth - Woods would have to finish out of the top 44, which looks possible. Of all the birdies Mickelson made down the stretch, it was the flop shot that gave him the biggest boost. "It was a good one," Mickelson said. "There were some at Augusta that I kind of remember a little more fondly than Thursday here in Akron, but that was a good one. I thought with the greens being soft, I had a decent lie, and it wasn't a difficult one to get up-and-down. But I certainly was fortunate for it to go in." While Mickelson went for the shorter driver, McDowell put a longer driver in play and figures he picked up 15 yards. But it was the shortest stick in his bag - the putter - that carried him at the end. He holed birdie putts of 12 feet on the 15th and 16th, made a 15-foot putt from the fringe on the 17th and finished with one last birdie from 10 feet. "It's probably the best golf I've played since Pebble Beach," McDowell said. All the attention that comes with winning a U.S. Open for his first major has been difficult, so this week was a nice reprieve. He is back in America with the world's best player. 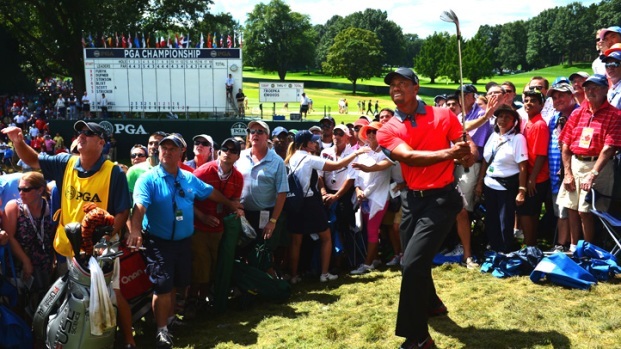 And at Firestone, "Tiger Woods' show is in town, so we'll have him in the limelight." For Woods, it was an unwelcome spotlight.